Zach Evans 4.51 official at the Opening!!! Full automatic, legit speed, not made up 4.4s or 4.3s. If that's true that's a really bad sign of things. Does he take plays off too? He is the best RB in the nation because he does all facets extremely well and NEVER taking off any plays is one of them. If he was a player like that, he would not get the notoriety and rankings that he has gotten. Yes...but only when the coaches take him out in the 2nd quarter when the score is 35-0. He's a burner. I've noticed alot of good laser times this off-season. Haynes King of Longview ran a 4.47 at Under Armour All American Combine, then ran a 4.5 at Elite 11 the following weekend. All laser. I'm more interested in The WR.....that kid can burn. Curious to see how this translates this coming year. Having seen him 7 or 8 games now over the past 2 seasons, about the only thing I could really ding him on was sometimes he got caught looking too long in the backfield, waiting for a hole to open up...then didn't quite have the burst to take off when he needed to. Those shuttle speeds look really good, and maybe I would expect him to have a little more first-step burst. Granted, it's nitpicking a very small area exposed largely as a byproduct of a dominating OL that gets him all sorts of lanes to run right through. That OL allowed him to get downhill quickly, leaving LBs badly exposed and out of position (Exhibit A: CyFair & Lake Travis). It was really only the Katy and Duncanville Ds that were able to use their front set to bottle him up for extended portions of their games. Last edited by 92Tiger; 03-21-2019, 01:18 PM. Curious to see how this translates this coming year. Having seen him 7 or 8 games now over the past 2 seasons, about the only thing I could really ding him on was sometimes he got caught looking too long in the backfield, waiting for a whole to open up...then didn't quite have the burst to take off when he needed to. Those shuttle speeds look really good, and maybe I would expect him to have a little more first-step burst. Their 3-headed monster on offense is scary to think about for this year. Look what they did as two sophs and a junior last year! Imagine the 2016 Lake Travis offense....with Zach Evans in the backfield...because that's what 2019 could end up looking like. Only 2018 defenses that really came even close to offering a speed bump for them last year were Katy and D'ville, and those speed bumps were really nothing more than a couple of possessions scattered throughout the game. And usually it was just a matter of North Shore figuring out what those great defenses were trying to take away...and then make adjustments. Against Katy, keep throwing it to Banks. Against D'ville, let Davis loose out of the backfield. Last edited by 92Tiger; 03-21-2019, 01:06 PM. Yea being used to getting the ball and seeing daylight on almost every carry will have you mentally expecting to just get the hand off and go north to south. So when you see several defenders where the hole is supposed to be tells you to stop and change directions. 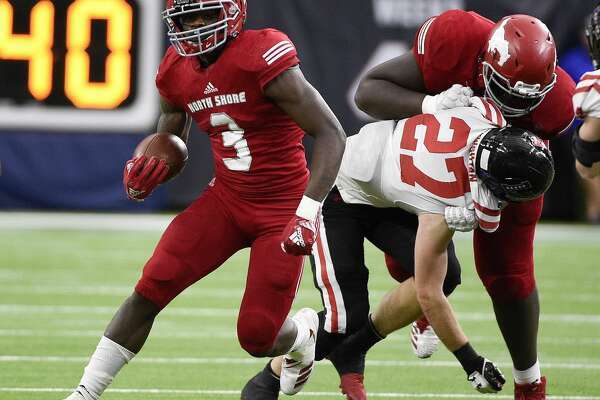 Have to remember, Zach was only getting 8 to 10 carries a game after the 15 he got in game 1 versus Katy. Now that he has a FULL season under his belt and was getting meaningful carries (20 or more) in the playoff run; he will get that instinct to take it outside or cut it back instead of that slight hesitation. It's a nice "problem" to have....are you the next Adrian Peterson or Derrick Henry? Running style (based strictly on what I see on the field) is a bit more Henry-like now. But his shuttle and 40 splits suggest he could end up very Peterson-like; he just needs more time to develop AP's ability to cut-n-go. I wouldn't say he takes plays off...It's hard to when you're only playing 15 plays a game and getting 7 carries on average. He just doesn't run hard all the time (Deondrick Glass runs hard all the time) I've seen him get tackled a few times by guys I know he could have ran through easily but I guess when you have bigger goals you need less wear and tear on the body. All times are GMT-6. This page was generated at 03:02 PM.